When it comes to cleaning your painted walls, not all paint types are created equally. Low-gloss paints such as flat and eggshell generally do not hold up well when subjected to moisture -- cleaning them with water may remove some of the paint. Opt for the gentlest cleaning method possible, even if it means dusting or spot-cleaning, for walls painted with flat finishes. 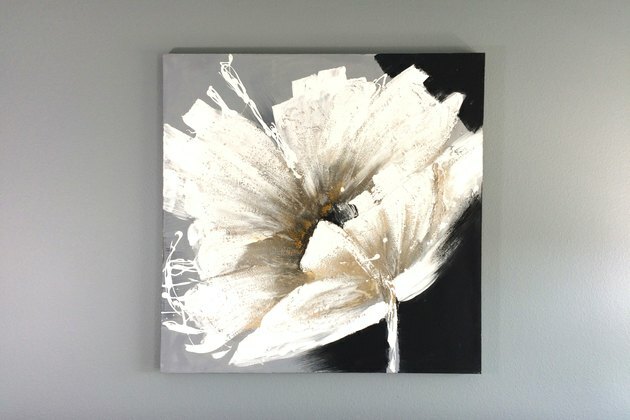 No matter what type of paint is on the wall, you must dust before doing any type of wet cleaning -- otherwise the dust may cause dirty smudges and smears when wiped with a wet cloth. Even if you don't intend to wet-clean the walls, dusting helps keep the indoor environment clean. Start from the top down, standing on a sturdy stepladder if necessary. Wipe the entire wall area -- even the corner where ceiling and wall meet -- using a dust pad, dust mop, feather duster or even an old cotton cloth. If the walls are incredibly dusty, wear a dust mask to avoid breathing in fine particles. Use the brush attachment on a vacuum cleaner if you'd rather not wipe the dust away. 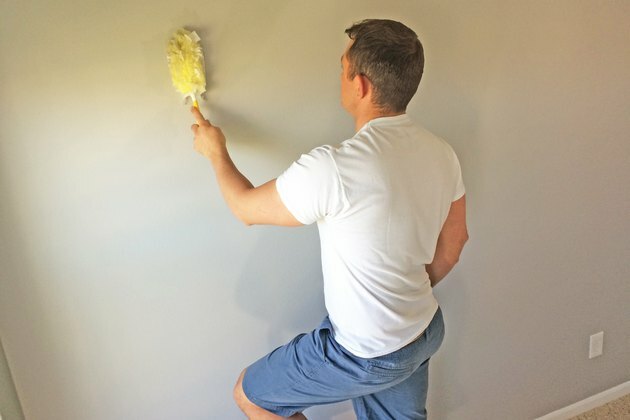 Before tackling a wall that requires a serious liquid-based cleaning, spot-test the paint, especially if you aren't sure what kind of paint it is. High-gloss and semi-gloss paints hold up well under moisture and are designed to be washable; paints without much glossiness may lose a bit of pigment when wiped with water, especially if the color is dark. Wipe an inconspicuous, small area with a damp sponge or soft cloth, checking for any color variation when the wall is wet. Check the sponge or cloth as well to determine if any of the paint pigment came off the wall. If the wet area looks lighter or different than dry areas, wait until the spot dries to determine if the paint finish was permanently affected. If the paint seems fine, it's safe to wash with a slight amount of moisture. 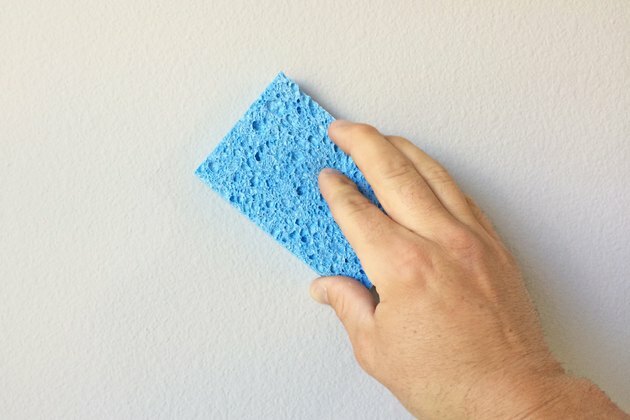 If you feel the walls could benefit from a wet wipedown, start with clean, warm water and a sponge -- in many cases, soaps and cleaners are not necesary, especially if the walls are not marred or stained in any way. Protect the baseboards and floor by placing a strip of painter's tape along the top of the baseboard, securing a plastic tarp or dropcloth to the tape. Wipe each wall from the top down, working in a small area at a time to make the task more manageable. 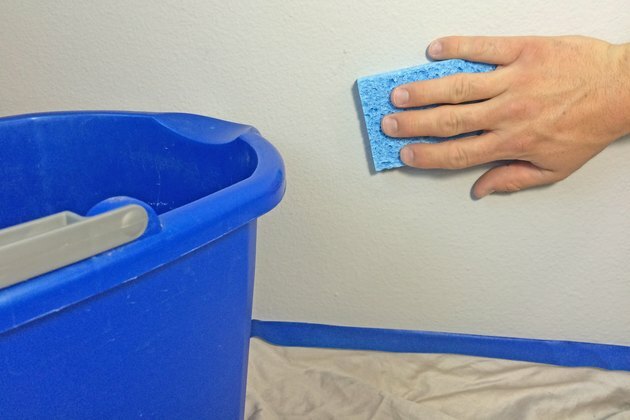 Dip and rinse the sponge in the bucket frequently, squeezing out excess water -- the goal is to wipe the walls with the minimum amount of water necessary. Replace the water in the bucket once it looks slightly dirty, or you'll spread more dirt around. If you need a mild cleaner, add a drop or two of a gentle dish soap to the water; use a second bucket of just water, along with a second sponge, to rinse the walls. Turn on a ceiling fan or open the windows, if possible, to hasten the drying time. Sometimes, cleaning walls requires spots treatments: crayon marks, greasy fingerprints or mystery stains mar those otherwise clean surfaces. Stains such as crayon marks or fingerprints may be removed easily with a melamine foam eraser, using it much as you would a standard pencil eraser. A bit of baking soda on a damp cloth or old toothbrush removes crayon marks and stuck-on debris; wipe the area with a fresh, damp cloth afterward to remove the baking soda. Mix 1 part vinegar and 2 parts warm water as a general degreaser for greasy, grimy stains. 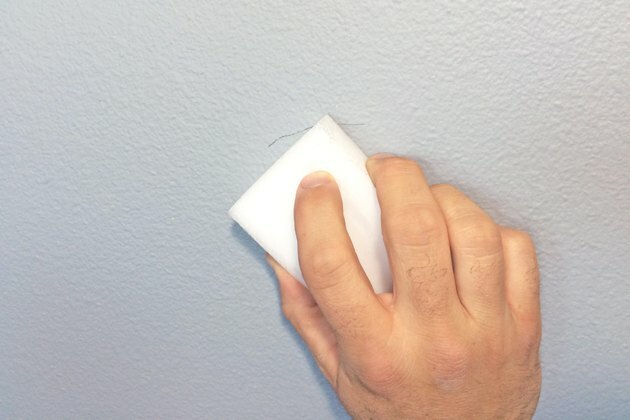 Wipe stains from the outside in to prevent them from spreading around the wall. With any type of cleaner, test an inconspicuous area of the wall first to ensure it doesn't damage the paint.